It’s time to put the kettle on and get a little comfortable in your chair as this project, much like the art of pottery, isn’t for those in a hurry. 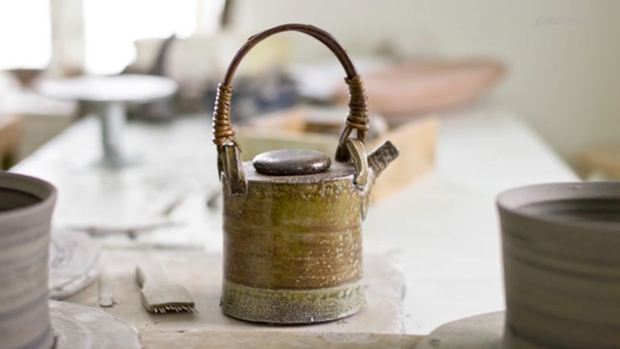 If you do have spare time on your hands and an avid interest in seeing individuals create one of a kind objects however then you’re in for a real treat, as we visit the work of Dane Anne Mette Hjortshøj and her pottery studio courtesy of the good folks at Goldmark art. The short documentary provides and insight into the life and work of Anne who bases herself on a humble Danish Island named Bornholm which is known for it’s dedicated craftsmen and women. Here she ventures to the local beach to source clay, maintain her two kiln studio and takes in a little inspiration from the open land around her. A simple yet refreshing approach to life, her story is reminder to us all that doing what we love really is the key to happiness and contentment. This film actually works as a great introduction to a handful of legendary Danish potters too, as Anne begins by explaining the story of how she learned her trade, continuing on to the artists that helped to form her traditional style. A recurring pattern I’ve found with a lot of fantastic potters I’ve come across is they’ve began as apprentices and worked their way up to working independently, which I’m not sure is the common practice in more recent times. I won’t keep you for to much longer now as there is more than enough to take in throughout the film, I will quickly just mention though that if you’d like to see more work from Anne Mette Hjortshøj or perhaps get a further infomation on the artist then I’d urge you towards “Modern Pots” who currently have a selection of her pieces for sale. You can find the link for this just below, but in the meantime watch on and enjoy!